I’m a big fan of Manhattans – I make them at home all the time. If I’m going to attempt a variation on such a revered classic, dear readers, I promise I’m going to make it delicious. I’m also a fan of cyser, a style of mead made by mixing honey and apple cider. Apples and honey naturally taste great with spices like cinnamon, clove, and nutmeg. Apple pie cyser is like a trip to my babysitter Wilma’s house where I spent afternoons as a kid. She always seemed to be putting the finishing touches on some irresistible dessert when I got there. There was an especially good bourbon barrel aged apple pie style mead on my shelf at home. I had been wracking my brains trying to think of ways to incorporate it into a cocktail, when one morning I woke up with the inspiration to replace the Italian vermouth in my Manhattan with this exceptional mead. A bolt from the blue! I was so excited! I wanted to rush downstairs and mix the drink up right then and there, but it was 7am on a Monday and drinking cocktails is not my full time job. Ignoring the urge to dawn drink, I went about my day like a responsible adult, with visions of charred oak barrels and apple pie fairies dancing in my head the whole time. When I finally got home, it was time for the real work to begin. I began building my Manhattan in the usual way: I added bourbon and ice to a cocktail shaker, then the bourbon barrel aged apple pie cyser, a dash of Angostura bitters, and stir. I always stir drinks like Manhattans and martinis with a long spoon instead of shaking. Stirring incorporates less air than shaking, and a crystal clear cocktail is the reward. I strained the drink into a rocks glass with fresh ice. Things were going well. I planned to use a cherry, but instead I squeezed a drop of fresh lemon juice onto a sliced red apple, and the Big Apple was born. When I tasted it, the first thing I noted was that it didn’t taste like apple. The spiced cyser added richness and fire to the bourbon, with just enough caramel sweetness to make it very easy to drink. I mentioned that the apple slices I used had lemon juice added to them. This does a great job of keeping apples fresh, but the hint of lemon also added a layer of flavor and aroma that worked as a nice top note to balance out the drink. Apple pie mead does not have the botanical complexity of good vermouth, and the splash of lemon helps to brighten this drink. A bite of bourbon-infused apple slice at the end was very refreshing. Squeeze lemon juice onto apple slices and set aside. Combine ingredients in a cocktail shaker with ice and stir. Serve up or on the rocks. Garnish with an apple slice. Pair with sharp cheddar, bacon wrapped dates, roasted cashews, and more apple slices. 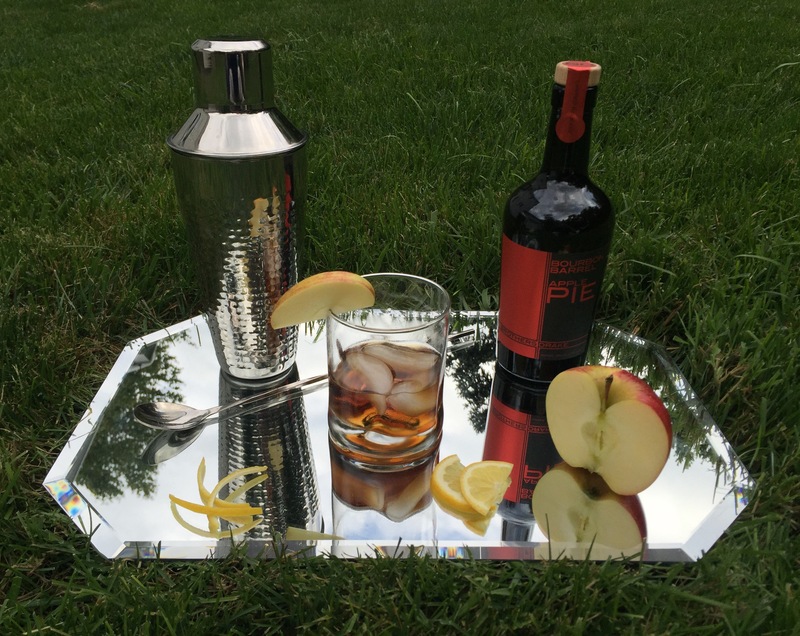 This entry was posted in Bourbon, Cocktails, Manhattan, Mead and tagged apple, bourbon, cocktails, Manhattan, mead on August 1, 2015 by meadmixologist.